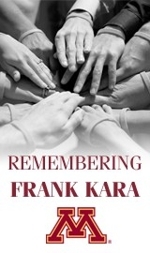 The Always Dreaming Scholarship is in memory of Frank Kara, former Director of Athletic Compliance at the University of Minnesota. He passed away following a courageous battle with cancer in the Spring of 2007. The Scholarship was created to inspire student-athletes to make their dreams into reality. Frank’s belief was simple – have a dream, plan the details for success, and then stick to the plan. Frank loved athletics and valued education above everything. He believed there wasn’t a better combination to help young people be successful. Use your competitive spirit and conditioning on the field to earn a degree and position yourself for success off the field. The Always Dreaming Scholarship is awarded annually to a student-athlete who chased their dreams to the University of Minnesota. They must be a leader that people respect because their actions speak louder than words. It’s a person who can make the people around them better and someone with the belief in excellence with integrity. The scholarship is endowed with the University of Minnesota Golden Gopher Fund. The winner will be recognized at the Golden Gopher Fund Annual Banquet in October. All net proceeds from your contributions will benefit the Always Dreaming Scholarship inspired by Frank Kara.